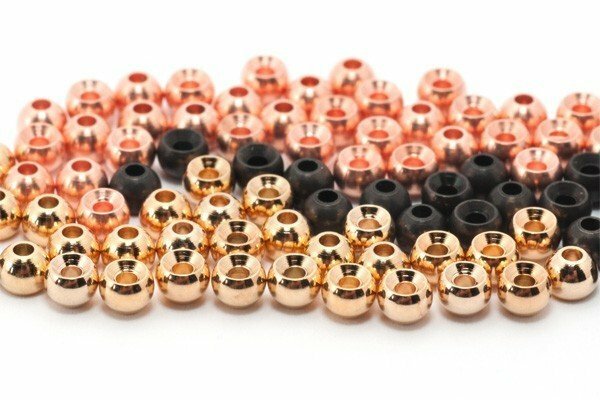 How you measure the diameters of the beads ( like brass beads, plastic beads or tungsten beads)? Use different size mesh sieves. With small mesh size the smallest beads fall through, the larger do not. 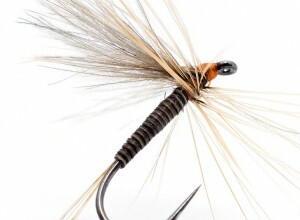 Use a slightly bigger mesh and the next size falls through, keeping the bigger beads. As you increase the mesh size, the beads fall through by size EVERY time. Need a bunch of sieves, but they are cheap and they get the job done. Mark the sieve as to the size bead it passes. Keep all of them out of the kitchen so wife does not use. Forgot to add:Softly SHAKE the mesh sieve so beads move around. That way one’s not perfectly round will fall through. Vernier is good but how? The beads themselves could be measured with vernier calipers for the most accurate reading, though you are relying on aligning all the measured beads exactly the same. Beads are not perfectly spherical, so you would need to ensure the measurements are taken from the same points on each measured bead. Not everyone has a set of vernier calipers at home (as I do), so a ruler or metal rule (preferably) could be used instead. Not quite as accurate as the vernier caliper but more accessible. The point about measuring across the same dimension of the bead still stands. Once the beads are measured; the most reliable way of repeatably measuring beads (say in high volumes) would be to use a card with punched holes in the sizes of most commonly used beads – like a spaghetti measure but with smaller holes sized for bead dimensions. Daniels method is a rough and ready method, but it is not repeatable nor reproduceable. 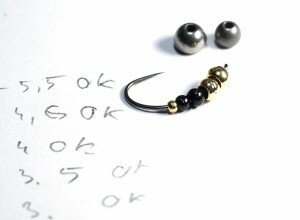 If I have say 5 beads of 1mm, 1.1mm, 1mm, 1.2mm and 1.mm; the total will be 5.3mm. If I measure using Daniels method, I will know that I have 0.3mm ‘extra’ but I won’t know which beads are bigger or smaller by eye. All I will know is that I have an ‘extra’ 0.3mm … that I shouldn’t have … so it’s not a reliable method. If you size a card with holes (e.g. a bead template); you would have a more repeatable and reliable measure of bead diameter because a 1.2mm bead won’t easily pass through a 1mm diamteter hole. the fast & simple way.. and the fastest way.. to read what you put on the packet that you send us!! correct. Better with 10 or 20beads! No measuring needed. All beads are created equal, stored in one box full of different colors, sizes and materials. 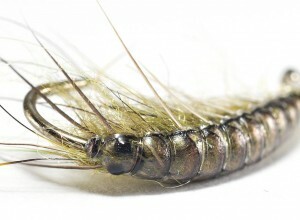 When tying a new bug, simply open the box and go with your feeling. On the hook it goes. 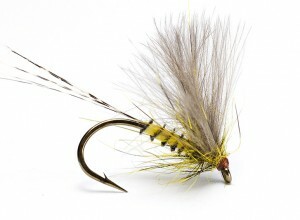 If it fits and feels right proceed to tying the fly. If it doesn’t feel right, swap the bead with another one in your box. Repeat as needed. Find out how ‘the guys’ are measuring the beads. 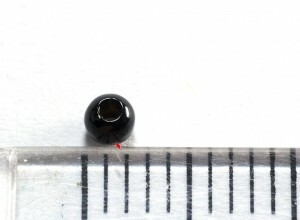 Beads are not perfectly spherical so it would be easy to measure the exact same bead as 3.3mm and 3.5mm depending on where and how you measure them. I have printed out a measuring paper, that one used with a lot of tiny squares. I just put it on it and instantly see how many squares it cover. Hi, yoi can use this http://articulo.mercadolibre.com.ar/MLA-613368302-plantilla-de-circulos-marca-pizzini-10-puntos-_JM . Sorry for copy the link, but i cant paste a photo. Its a thecnical drawing ruler. Cost about 5 dls. Come with holes from 1 mm, 1.5 mm, 2 mm, etc. PS. This ruler come un 0.1 mm variatons too.